We are fortunate to live in an area of New England that is beautiful almost every month of the year. 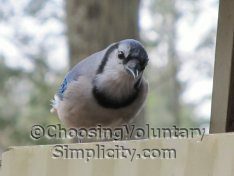 It would be difficult not to appreciate the green lushness of summer, or fall’s vivid leaves and bright blue skies… even the pure white of the winter snows… but spring here in zone 4 can look pretty bleak. The overall look is brown, muddy, and uninspiring. Unless you look for the beauty that is already there. That’s what I’ve been doing ever since the snow melted, because my gardener’s soul felt such a deep need to see something green and growing! I suppose it’s not surprising that many of the first flowers to appear are from plants that could be considered invasive at any other time of year. Now they’re a very welcome sight. 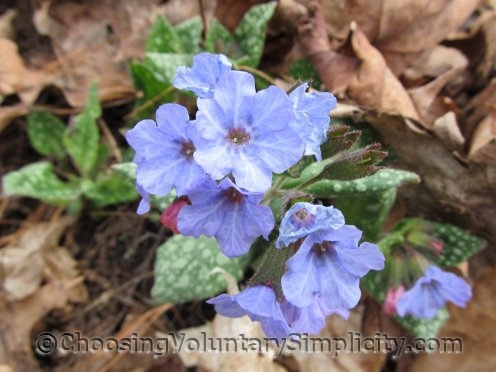 The pulmonaria are everywhere again this year… they’re always one of the first flowers to bloom. 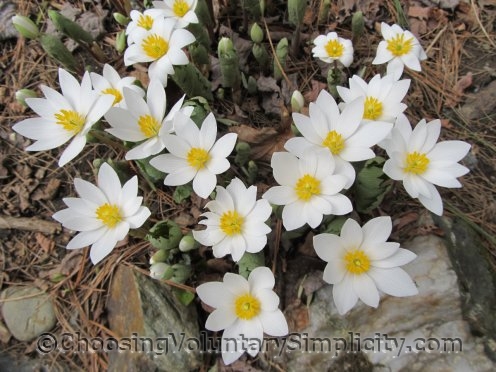 The bloodroot are also in full bloom with their flowers popping up in the most unexpected places. This particular clump seems to have a few extra petals on almost every flower. Our front lawn is literally covered with small glory-of-the-snow flowers. I have no idea how they came to be here, because I have never planted any of their bulbs. 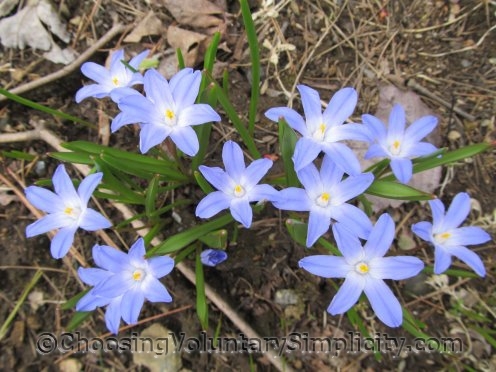 The squill I transplanted last year from the side of the road is also in full bloom. 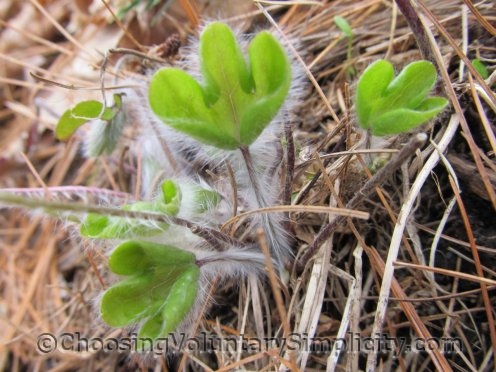 This year’s hepaticas’ leaves and stems are covered with the longest “hairs” I have ever seen. The hepaticas have been blossoming for a couple of weeks now and are mostly going by. There aren’t many of these delicate little flowers still left in the woods now that so many of the trees have been cut. 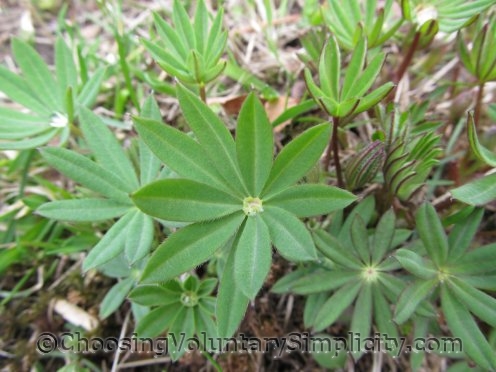 The lupines are another “volunteer”… I planted only a few seeds many years ago, and lupine plants have been spreading like crazy ever since. These are mostly purple and pink. I have more seeds to plant this year for other colors. Most of the hostas are up and their leaves are starting to open. The bleeding heart shoots are several inches tall. The crocus flowers are out… the tulips, daffodils, and jonquils are budded. The primroses are covered with blossoms and the sempervivums are starting to show their vivid spring colorations. It’s going to be another beautiful summer, I think. We are a few weeks behind you here in our part of New England. 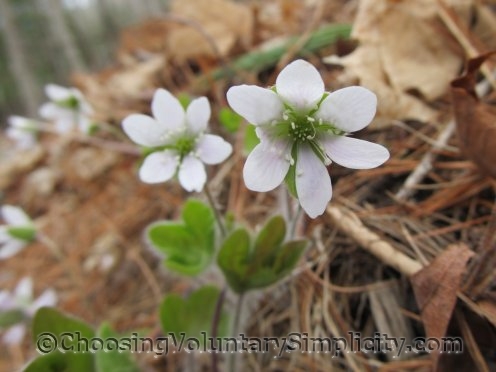 I just took my annual hepatica pictures this morning. I love those little blossoms. If all these small gems came at another time of the year, their beauty might be overlooked. After a long winter, every little find seems like such a gift. I was disappointed to find that my pulmonaria died over the winter. It looked lush and healthy last summer, but I can never keep it for more than a few years before it dies on me. It was an incredibly hard winter–not sure if that’s what did it in or not. I think you need to live in this area before you understand (as Shirley said) the bleakness of New England spring. I lived for 3 yrs in West Virginia and we had snow but the snow melted and everything was green almost immediately and flowers started and there was none of that brown deadness that comes in this area. I understand so well the urge to see something green. I’m that way myself so I loved this post and the lovely photo’s.